Taken to the Tyburn Tree, prisoners from Newgate jail, sited where the Old Bailey now stands, would all get scented gifts from the several thousand spectators on hand. aA final, free drink was provided at the Mason’s Arms public house, still open today. Hanging, however, was not the only method of execution, and some were far more grisly. 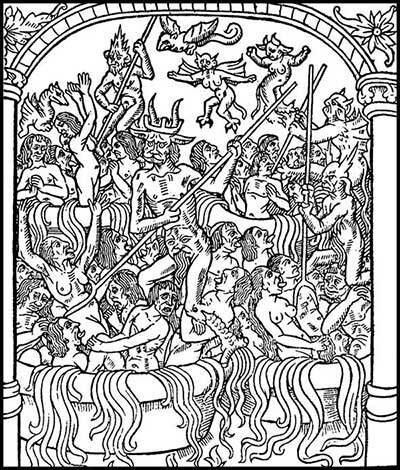 Being boiled alive was a quite legal and acceptable method of execution in 1531, when Henry VIII was king, his having passed the relevant law that very year. One man who suffered this awful fate was Richard Rouse, boiled alive at Smithfield market in April, 1532. He had been cook to the Bishop of Rochester, found guilty of killing a dozen people in ridiculously trying to poison his boss. Another killer to suffer this fate was maid-servant Margaret Davy, in 1542, for poisoning people she had lived with. 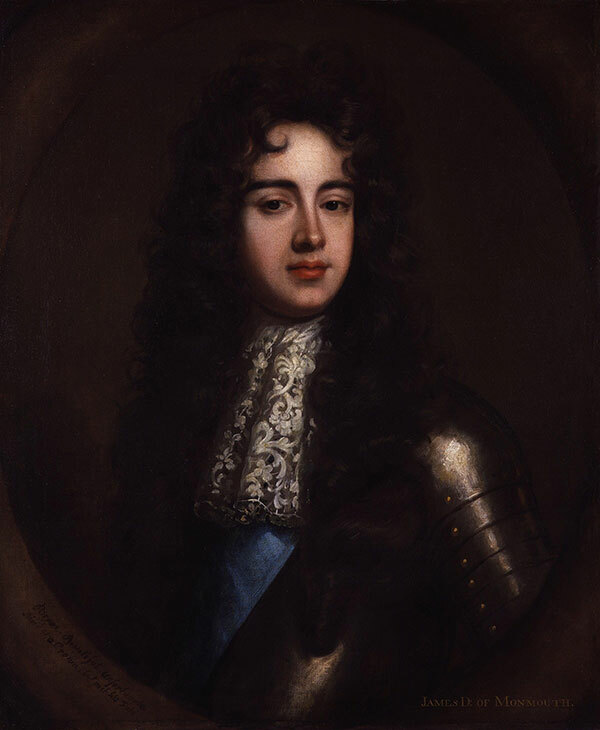 In 1685 the executioner of Charles II’s eldest son was Jack Ketch. Convicted of treason and sentenced to death, this poor man was subjected one of the most botched executions in recorded history. Bizarrely, history relates that the king, having no official portrait of his child, had the head sewn back onto the torso, so a sitting for such a royalportrait could take place. French watchmaker Robert Hubert confessed to starting the Great Fire of London in 1666, for which he hanged from the Tyburn Tree. It is now known that he could not have committed the crime, not having even been in the city on the day of the fire. It is widely believed that this disabled man, who was mentally challenged, was the unwitting victim of an anti-Catholic conspiracy. Burning down even a single building, in those days, not to say over 13,000 of them, was punishable by death, remaining so through to 1861. It is now thought the confession was tortured from him. The Scottish sailor who, through ill luck and misfortune turned to piracy, becoming known as the notorious Captain Kidd, was also to suffer an ignominious fate, when captured and put on trial in 1700. The whole case was a real sensation in the London society of the time, and it was felt that an example needed to be made. 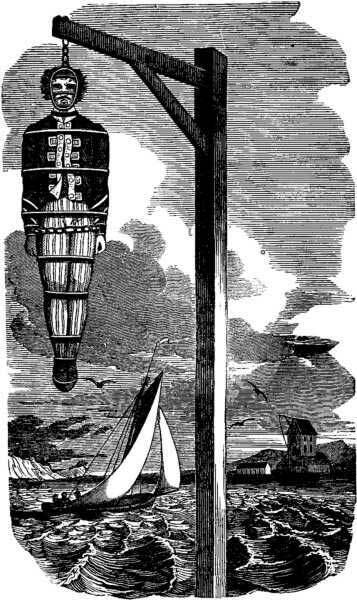 He was, as pirate tradition would have it, hanged from the yardarm at Wapping Stairs, where three tides were allowed to wash over the body before it spent twenty years hanging in chains at Tilbury docks. 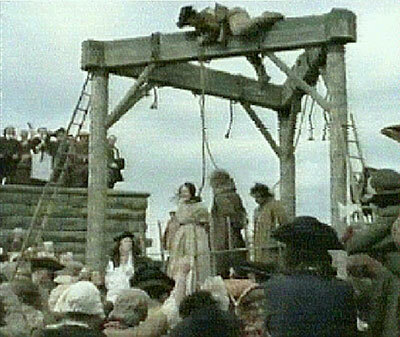 Before 1772, wealthy people found guilty of capital crimes could elect to undergo ‘peine forte et dure’ , ‘hard and forceful punishment’ in French, which meant allowing themselves to be slowly squashed to death under a wooden board laden with heavy wieghts, suffering this hideous death because it was the only way they could avoid having their property confiscated by the Crown. 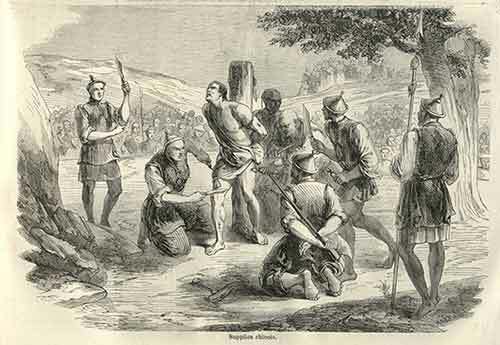 Roman Catholic Martyr St Margaret Clitherow, suffered this fate March 25, 1586, for harboring, at the time outlawed catholic priests. 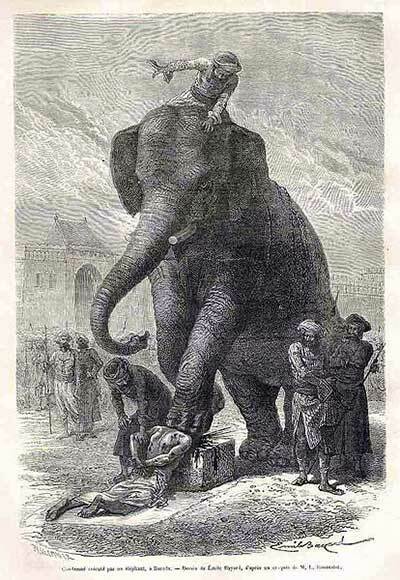 15 minutes, beneath 700 pounds of dead wieght, was the time it took for her to die. Other victims of this cruel killing wereMajor Strangways , in1658, and John Weekes , in 1731, both of whom had refused to plead guilty, despite the torture, being killed by merciful onlookers, who sat on the boards to finish them off. 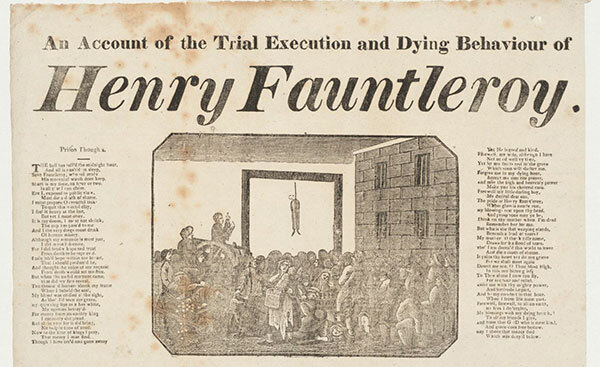 Henry, “Little Lord” Fauntleroy had the distinction of seeing the largest ever crowd for a public execution, on November 30th, 1824, outside Newgate to witness his slaying. 100,000 people were baying for his death. His crime had been to defraud the Bank of England in the sum of £250,000, the equivalent of perhaps £40 million today. The thing that really got the crowd incensed was his utter indifference to the way he had squandered the money, living a high life most could only ever dream of. Going cheerfully to meet his maker, he was the last person ever hanged in the UK for the crime of forgery. 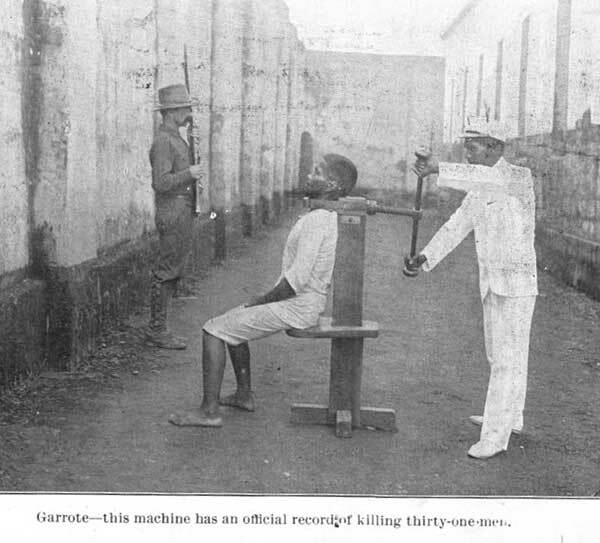 Some methods of execution, like the death oh a thousand cuts, shown below, were even more brutal, but the sad fact is that people always bay to watch. What perverse creatures humans are. 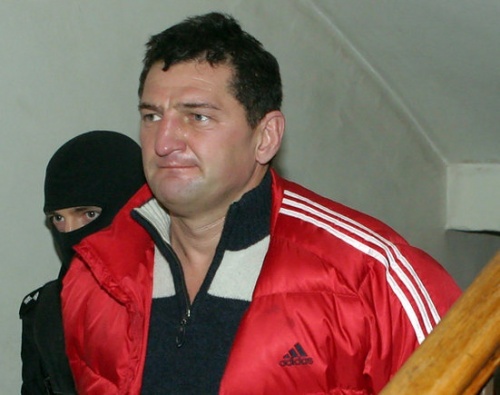 Dr. Henry (alias – Henytė) – one of the most famous criminals of all time in Lithuania, the Lithuanian media is often referred to as the criminal authority. Dr. Henry (alias – Henytė) – one of the most famous criminals of all time Lithuania, the Lithuanian media is often referred to as the criminal authority. Convicted twice. He alleged a number of crimes for extortion, bodily harm, murder. Anticipated that it may be killing his cousin and he put together his protected gang members. Dr. Henry is convicted for extortion and witness the impact . 1997, February 13, the day of the Vilnius district court granted Dr. Henry 8year prison sentence for mediation redemption cars threats and former Head of the Protection of Ancient Agora (now the Court of the former Criminal Police Office of the Deputy Head) Yuri Milevsko, if that, witness the court recognizes Dari Mačianską which the kidnap of his car . In October 2001 from Dr H. Vilnius 2 nd amendment to the strict regime colony was released into the freedom for good behavior, completing a three-quarters of the punishment. Terrorism is a major cause of fear, anxiety, and destruction all over the world, in countries like India, Pakistan, USA, UK, France, China, and Spain. How can we get rid of terrorism? Can anyone ever get used to terrorism? No, it is always a traumatic event for the people involved. A survey, funded by the National Center for Food Protection and Defense, conducted over the Internet by TNS-NFO 2005 among 4,260 U.S. residents over the age of sixteen found that 98 percent of U.S. residents believed there will be another terrorist attack during their lifetime. There is no universally valid common definition of terrorism. Terrorism is commonly understood as a systematic use of terror for ideological goals, especially targeted at civilians (non-combatants). If anyone uses terror for making profits or snatching other people’s possessions, it’s robbery, piracy etc and not terrorism. The United Nations Security Council Resolution 1373, in response to 9/11 attacks on the USA unanimously imposed on all members that all members shall not finance, support terrorists or provide safe havens for them. Most countries, especially those that have suffered from terrorism, have some form of legislation specifically authorizing anti-terrorism measures. There is much debate about the definition of terrorism and what is considered lawful response. Historically, the main argument against terrorism is the unlawful use of violence. Depending on the point of view, unlawful violence has been used for centuries by many nation states to further their own commercial, political ends and further their hegemony ambitions as well as destabilize or delegitimize political opponents. Thus, nation states themselves can be seen as becoming guilty of practising the same crimes they accuse the terrorists of doing. Further, the response to terrorist attacks seldom addresses issues that produced terrorism in the first place. Significantly, the United Nations Security Council Resolution 1373 does not require nation state members to investigate the reasons, which produce these horrendous acts of violence. Most of the known terrorists today are networks. Some are home grown inside nation states, with or without support from powerful groups inside that nation state or with external support even from other nation states. Many are loose international movements functioning as autonomous cells with sophisticated support and functional systems. There are many notable instances of people called terrorists by others abandoning violence and actually becoming peacemakers. In 1947, the New York Times describe Irgun, the militant Zionist group fighting against the British occupation, as a terrorist organisation after the King David Hotel bombing in 1946, which killed 91 people. Eventually, their leader Menachem Begin became the prime minister of Israel and won the Nobel Peace Prize in 1978. Nelson Mandela, another Nobel Prize winner respected all over the world today, could enter the UN only in July 2008 after being taken off the US list of terrorists by President Bush. Samuel Adams, one of the leaders of the 1773 Boston Tea Party, a terrorist from the British government perspective, is respected as the “Father of the American Revolution”. Terrorism machinators have now adopted a Wikipedia approach, where planners rely on users (media, terrorism analysis industry and media users) for maintaining and contributing to their aims of spreading terror. The masterminds behind the recent November 26,2008 Mumbai attacks have understood how important their terrible actions are for a terrorism-hungry media, a terrorism analysis industry, local politicians and power groups eager to capitalise on the event. By showing their faces on CCTV cameras, the terrorists assumed that their images would be broadcast all over the world, and they were. The media response has been a guarantee of instant fame (notoriety) for the perpetrators. A few days ago the news of the British terror suspect Rashid Rauf being killed in a US drone attack in North Waziristan was spread in global media along with his picture and biographic profile on major media sources. Do these incidents reveal a new culture of instant attention and fame? Is it the same psychology driving people to take part in programmes like reality shows, Idols and Big Brother? Are we experiencing celebrity terrorism? The psychology behind their recruitment is fame, which they would never get otherwise. The machinators have understood this emptiness in the inner lives of the young men and fill them with hatred and commands for doing terrible violence. The standard response to terrorism has been to fortify borders. Well, can we have a fortress USA, a fortress UK, China or India in this contemporary world of globalization, transparency, and interdependence? What about seriously directing efforts and a part of these hundreds of billions spent on anti-terrorism wars etc., at creating social, educational, and entrepreneurial structures that would give create jobs for young men in areas where terrorism originates? Would making roads, building houses, schools, hospitals, and energy production facilities for the local people drive most of the young angry men away from the clutches of the evil machinators? Surely, it would boost the struggling economies of the developed world by giving jobs to their workers too.